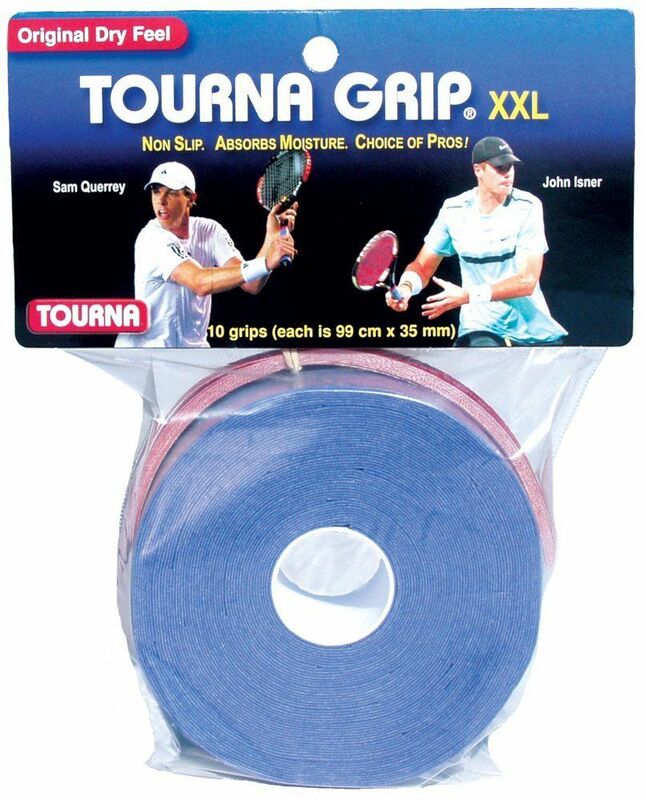 TOURNA GRIP. It’s an overgrip, meaning you put it over top of the factory grip. 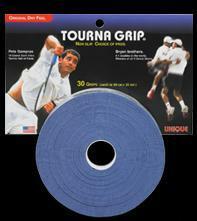 I love Tourna Grip. I love that it’s thin. I love that even though it’s thin, it’s really absorbent. I love that they only have blue. I love putting on the red tape to tie it off. 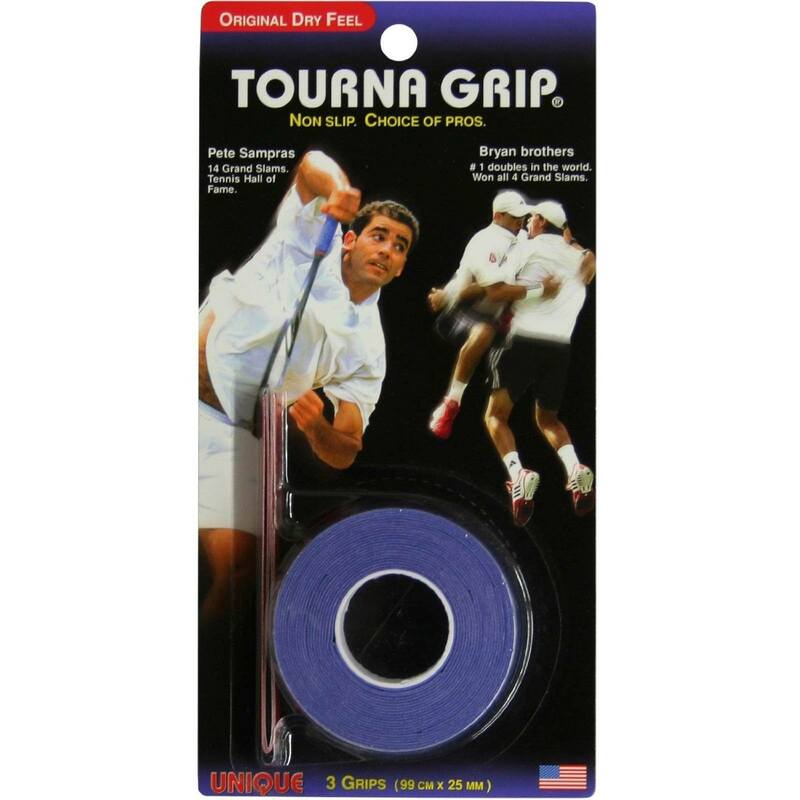 If it ever became legal in Pennsylvania, I would totally marry Tourna Grip. Here’s the original size. According to the package, it’s 99cm long by 25mm wide. I think that’s the one I have mainly used over the years. I just measured one from my bag and it’s 25mm wide, so yup. 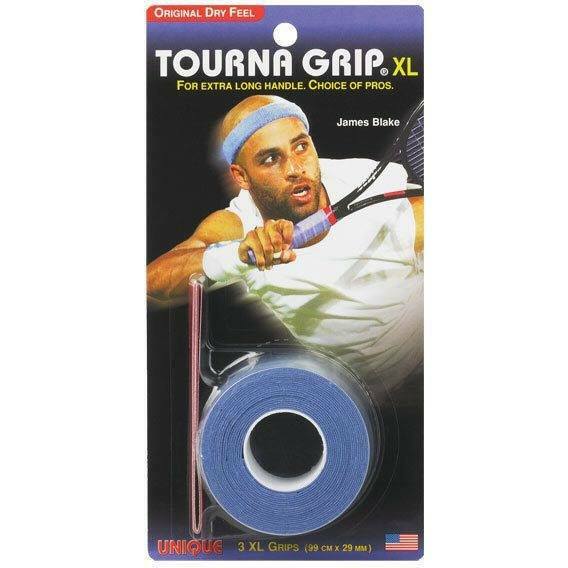 Then there’s the XL size, which according to the Tourna Grip Website is supposed to be “cut 20% wider to cover bigger handles and/or more overlap when wrapping”. The measurements on this are 99cm long (same as the original) by 29mm wide (which is technically only 16% wider, but who’s counting). 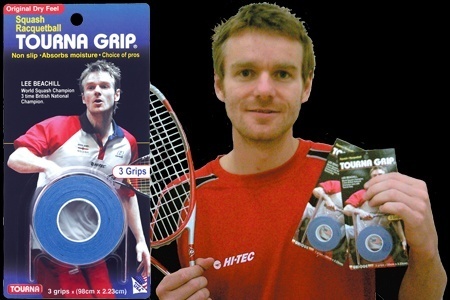 I am pretty sure I have used this size before and it works great for squash, but I am embarrassed I don’t have a definitive answer on that considering how I want to marry Tourna Grip, so I have just ordered some in the XL size and will update this page once I’ve tested it. This size is 99cm long by 35mm wide, so 40% wider than the original size. I have never tried this for squash, just posting it for reference. Say whaaaat, a squash-sized Tourna Grip? I never even heard of this until I was researching this post. That’s squash great Lee Beachill on the package. This grip is 98cm long (so 1 cm shorter than the original) and 22.3mm wide (so 10% narrower than the original). I’ll have to try it out sometime. 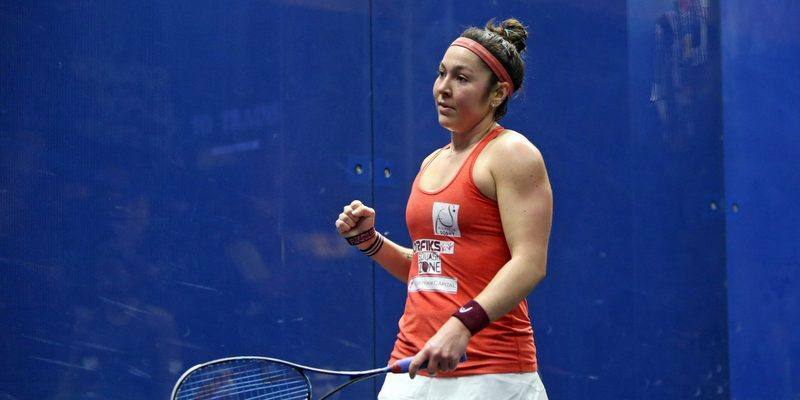 Amanda Sobhy was using Tourna Grip at the 2019 Texas Open. Them Harvard kids smart after all! Thanks to Will for the tip. thank you for your review of both the Karakal PU as well as the RKEP G08. Sad to hear none of the two could be an alternative for you. 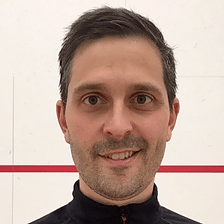 While I expected your evaluation of the Karakal because I share your problem of sweaty palms and none of the tacky PU grips has ever worked for me, I had hoped for the G08 to be suitable for you – like it is for me. Just like I posted earlier, I have to agree that the Tourna Grip is the driest grip out there (at least that I know of), sadly my skin is not yet (I did buy a second pack) resilient enough to withstand it’s abrasive nature and my thumb keeps tearing it in pieces which makes it last only for a few hours. Keep it up and also thanks for the other recent and once again very insightful reviews! Ha ha it was worth a try, thanks for the suggestion. I have been testing Yonex Super Grap and I’m finding that it’s a pretty good alternative to Tourna Grip. The only grip I’ve ever been able to use as an alternative! I’m a relatively recent Tournagrip convert after seeing this plus threads on Reddit. In response to the durability concerns, do people realise that once they are too greasy you can just take them off, wash them in soapy water and re-wrap them using the other side? Just stick them under the hot tap with some soap or in a clothes wash. I use two together with no grip underneath and the same pair have lasted about 2 months (playing 3-4 times a week) because I keep washing and rotating them to keep the fraying to a minimum. 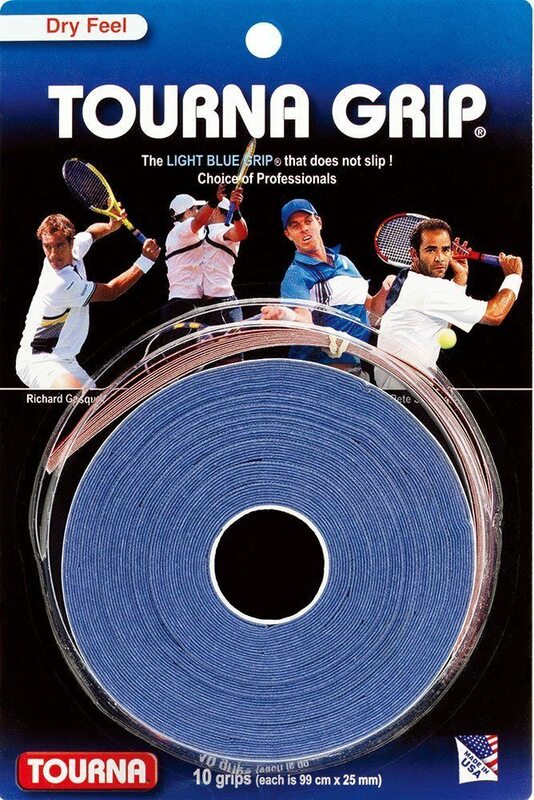 I bought a 3-pack of the original Tourna Grip to compare it to the RKEP G08 and Yonex AC 102 Super Grap to find an overgrip suited for people who have problems with (extremely) sweaty palms. 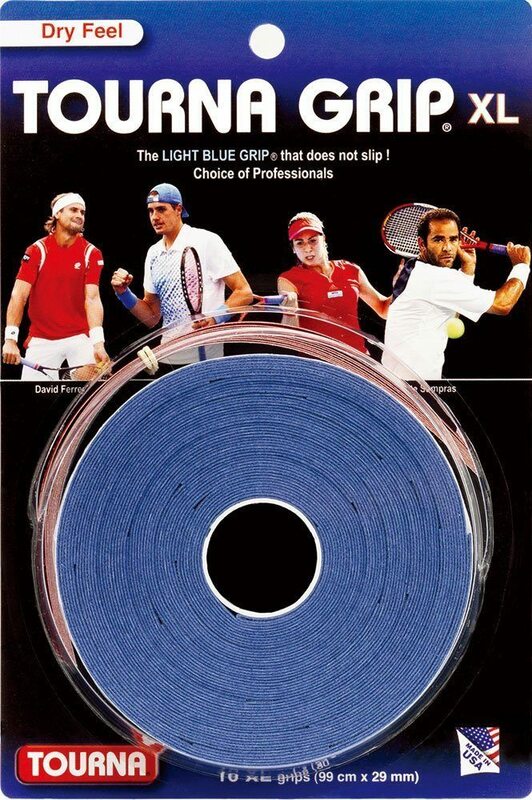 I can confirm Tourna Grip works very well for those, actually I find it feels the most dry/least soaked of the three overgrips even after hours of play with a single racket. Sadly Tourna Grip is also the most abrasive and gave me blisters at my thumb, index finger and palm like no grip tape has ever before. 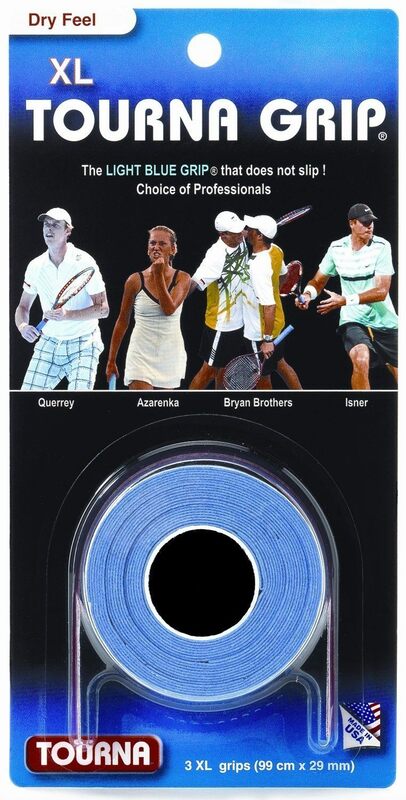 Furthermore Tourna Grip seems to be made of some kind of paper/cellulose instead of PU like G08 and AC 102. The Tourna Grip wore out in less than 10 hours of play for me with little pieces ripping out of the tape at the places where I push my thumb into the handle, which lead to a surprisingly uncomfortable hand feeling. For me performance wise Yonex wins by a tiny margin over RKEP and a more significant margin over Tourna. At 0,6 € compared to 2€ for Yonex and 2.35€ for Tourna (in Germany), RKEP will become my go-to though, it simply has the best price-performance ratio. Its great for sculling. Probably the single best grip out there. needs to be changed after about 10 outings. So, not just for tennis and squash! It was also perfect for getting a grip on a sink U-bend that had seized. I keep an industrial quantity at home, just in case they stop making it. Versatile! I refuse acknowledge the possibility that they would stop making it. 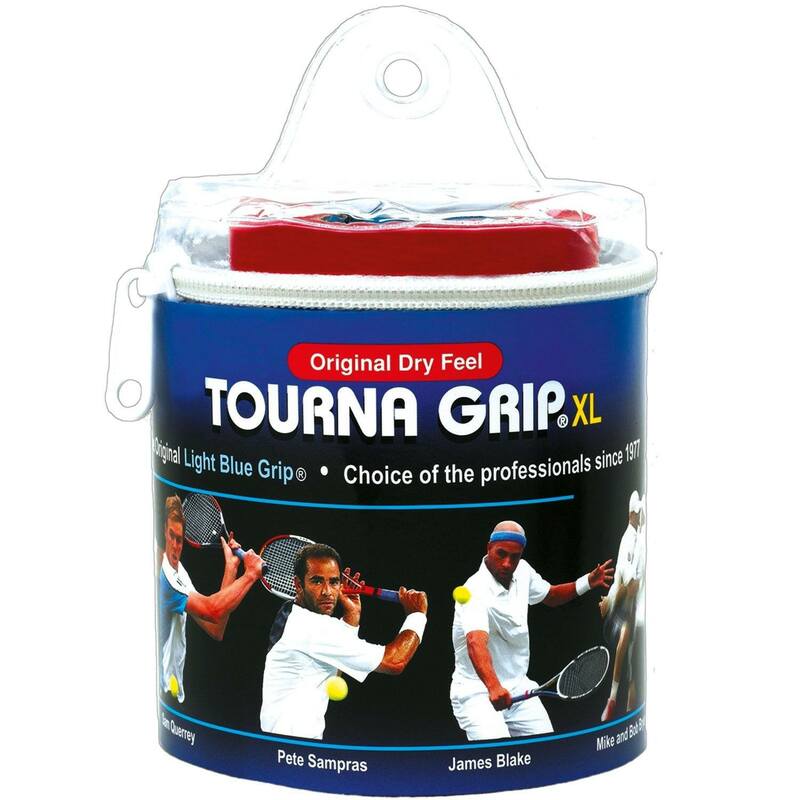 Tourna grips are suppose to wear out in a short time hence the name tourna from tournament. These grips are good for sweaty hands. Dry hands need tacky grips. 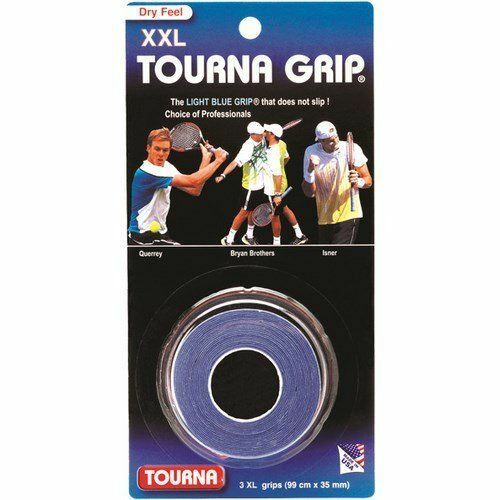 I have a roll of tourna xl but i seem to lose my control (grip) of the racket with tourna. Thats not the case when using karakal replacement grips. Do you put it over the factory grip or a thicker, replacement grip (like the Black Knight rad wrap)? I tried it for a season and found when it wears out…it REALLY wears out. I just put them over the factory grip. I like the feel of a thinner grip though. TournaGrip does wear out though. I probably replace it every month.